This February marked the 25th anniversary of World Spay Day and also the ninth year that HSVMA has celebrated the event by awarding grants to three veterinary student supported clinics. World Spay Day - the last Tuesday of each February - was created by the Doris Day Animal League in 1995 as Spay Day USA. Since then, it has evolved into World Spay Day as countries around the world have recognized the importance of accessible spay/neuter campaigns for community animals who might otherwise be euthanized or killed. World Spay Day in this country provides an opportunity for shelter and rescue organizations to highlight their spay/neuter programs and to help community members with affordable access to basic veterinary care. 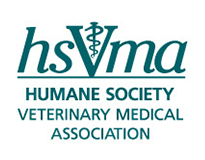 HSVMA feels that this day is particularly important for giving veterinary and veterinary technician students an opportunity to learn spay and neuter techniques and the basics of running a high-quality, high-volume clinic. 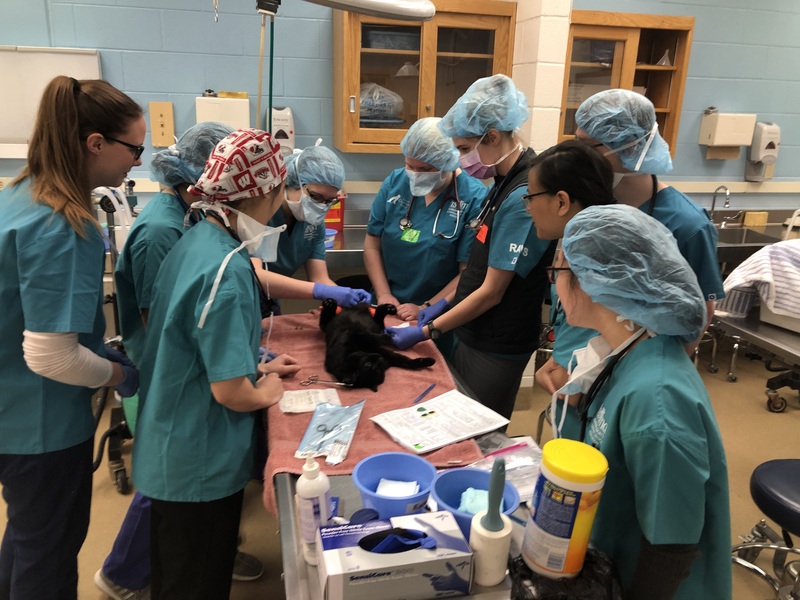 As overpopulation in shelters continues to be a problem, students learn the importance of bringing spay/neuter to communities in order to save the lives of millions of homeless animals euthanized every year. AUBURN UNIVERSITY: Second-year and third-year veterinary students from Auburn University participated in a clinic serving the Cherokee Humane Society in Acworth, Georgia. This small rescue helps pets in their community through their "SAAVE" programs - Save, Alter, Adopt, Vaccinate and Educate. The students helped perform approximately 40 dog and cat sterilization surgeries with the help of Dr. Jeremy Deaton, Affiliate Faculty member at Auburn University College of Veterinary Medicine, who helps teach the Veterinary Service Learning and Outreach Elective and Dr. Roger Nichols, a local veterinarian and practice owner. 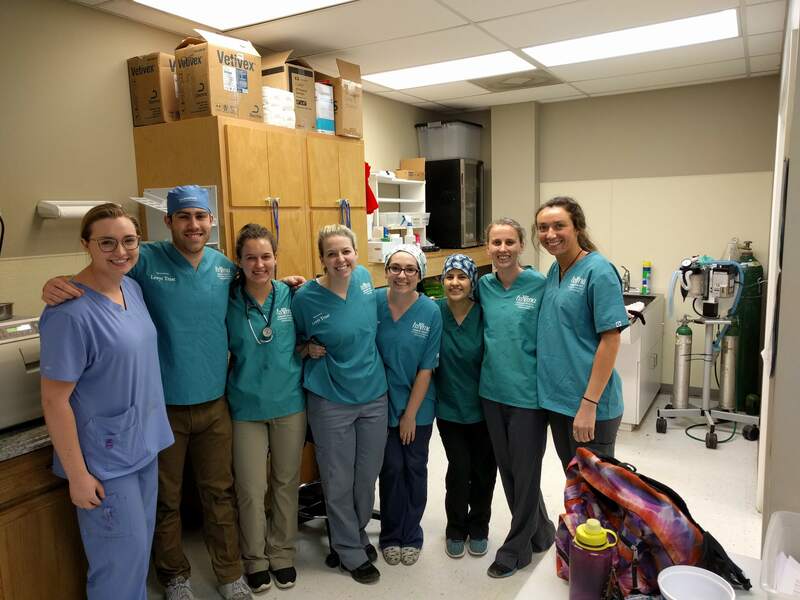 Sarah Christie, a veterinary student volunteer, said of her experience, "The Spay Day was an awesome opportunity for community service and a great learning opportunity for us, the veterinary students. I appreciate having the opportunity to provide service to the community and learn from my seniors and my peers." Krista Wood, the HSVMA Student Representative at Auburn, stated, "I started vet school because I love biology and wanted to practice medicine but what's kept me going throughout vet school are the opportunities like this one where I can use what I know to help animals and people in need." UNIVERSITY OF WISCONSIN: Veterinary students from University of Wisconsin, Madison, helped organize a World Spay Day clinic in collaboration with Madison Cat Project. Madison Cat Project works with local organizations and shelters to find adoption options for cats who are difficult to place in homes due to undersocialization or medical issues. Approximately 50 cats were sterilized at the clinic which was held at the University of Wisconsin School of Veterinary Medicine. Ten veterinarian volunteers helped teach the students the valuable skills needed to run a high-volume, high-quality spay/neuter program. Three veterinary technician students from Madison College also volunteered and learned important anesthesia and surgical recovery skills. Morgan Siewert, the HSVMA Student Chapter President at Wisconsin, said this about the clinic: "A lot of people think that the students are lucky to have this experience, and as that is true, we are also lucky to have cultivated a relationship with a community that supports and believes in this program." Another student and chapter officer, Zoie Schaefer, summed her feelings up by stating that "spay days are awesome. What a great learning experience." 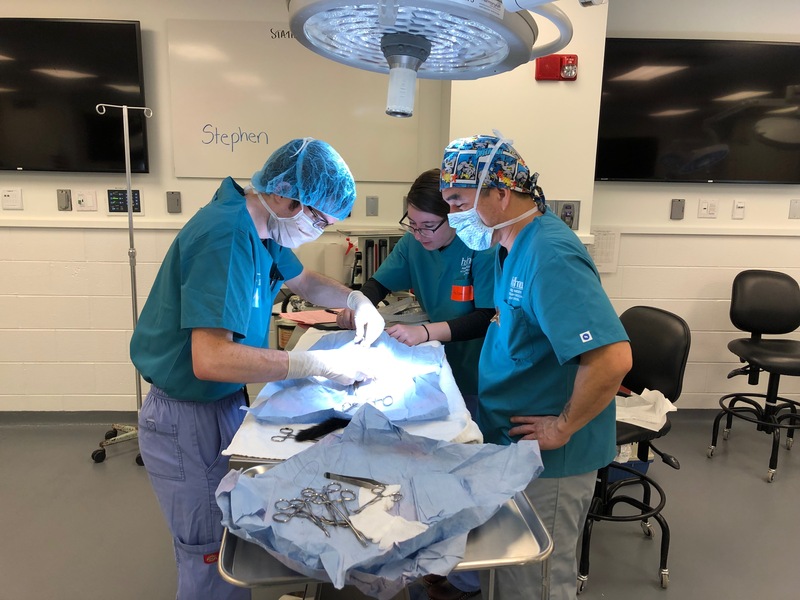 CORNELL UNIVERSITY: A team of Cornell University veterinary students collaborated with FARVets, an organization that promotes animal welfare domestically and abroad by providing sterilization services, wellness and education to communities. FARVets recognizes the need to address feral cat overpopulation within the Finger Lakes region of New York State and regularly provides service to the area. The veterinary team performed approximately 80 cat sterilization surgeries during their World Spay Day clinic this February. There was a huge response from the community and the students are already planning to repeat the clinic next year! 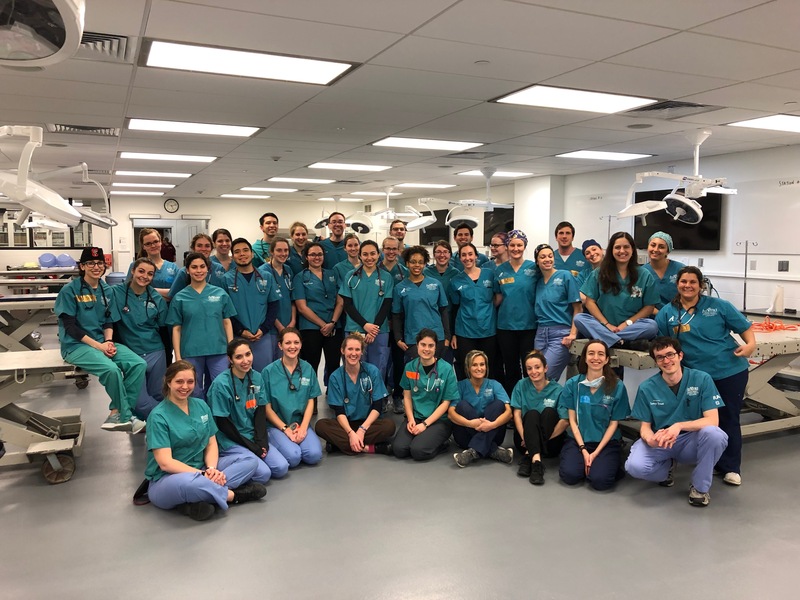 The students' comments prove that volunteering with spay/neuter clinics is a perfect way for students to learn hands-on skills and gain practical experience they can apply to their work after graduation. "Cornell Spay Day was an incredible opportunity to practice patient management and clinic organization. I gained invaluable experience helping to lead the anesthesia team," said student volunteer, Perry Koehler. Zoë Greenfield wrote, "Spay day was an invaluable experience. This unique opportunity allowed me to practice medicine while providing a critical service to the community. Not only did I hone my surgical skills but I learned new skills that I will use throughout my career." HSVMA hopes that it can continue to support students in their endeavors involving World Spay Day for many more years to come. The clinics offer a unique experience to students that cannot be taught in the classroom alone. And outreach to the community is a vital aspect of making spay/neuter programs successful. Here's to 25 more successful years and a continued partnership with our veterinary student and faculty network!